– had a bit of a run-in with the bloke at the campsite on Monday when I turned up to pitch base. Unfortunately he wanted all PG’s and HG’s to camp together (in a not so great part of the campsite); I thought I’d understood where he wanted me but he wanted me to move – this whole experience left a bad taste (I wanted to be welcome there) so I de-camped to the smaller and I have to say MUCH nicer campsite just out of town. I know it’s not as convenient for briefings but I like it here - Doris arrives on Saturday and will be happy, I am sure. We had a lovely day flying yesterday. Base upto 8000' and nice climbs be it a little rough at times but that's St A;-) Very light wind which makes a change. And that was cool yo! That's really cool! Flying that way is so exciting. 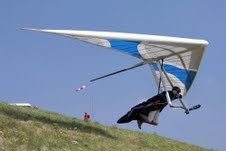 Hang gliding is one field of aviation that I love also. Thanks for sharing your experiences here.